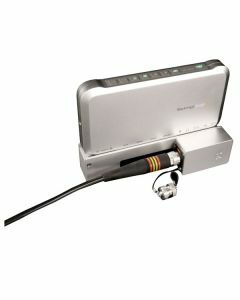 With FieldCast Adapter One Hybrid you can tap into the world of easy to use fibre optic connectivity and cover any distance between your OB Van and your live camera in the most professional way. Get the most out of your Blackmagic Design Camera Converter™ by using the FieldCast fiber optic system. Now you can use your Camera Converter™ and move freely in any environment and without worries about empty batteries! Adapter One Hybrid has the smallest form factor possible and the aluminum design makes it light as a feather. Adapter One Hybrid is built for studio and field use. The adapter features a FieldCast 2Core Hybrid Chassis Connector, so you can connect the 2Core SM Hybrid Main Cable to it, fast and easy. Fibre optic technology conveying copper for powering the camera, converter and charging its battery. All functionality of Camera Converter is unchanged. The LC Duplex I/O connection is neatly covered by the milled out aluminum protection block, but all other connectors of the unit are accessible as before, and you can connect your camera and all other gear as you did before. Easily connect the Adapter One Hybrid to Camera Converter, just remove the four screws at the back of the converter, put Adapter One Hybrid in place and screw it all together again, using the four screws that are part of the package. The resulting assembly of converter and adapter feels and behaves as one complete unit, and even the belt clip at the back, with its inserts for connecting to pods, rigs or arms, can be used like before, as if the adapter was not there at all! With Fieldcast Adapter One your ATEM Camera Converter has become sturdy all the way.